Due homage paid to Lisbon’s most important landmarks what naturally fitted into the agenda for Day-2 was more hope, less sun, some tram rides, a pop into some artsy neighbourhoods and finding those picture perfect miradouros – one such view point that could change our day old point of view. 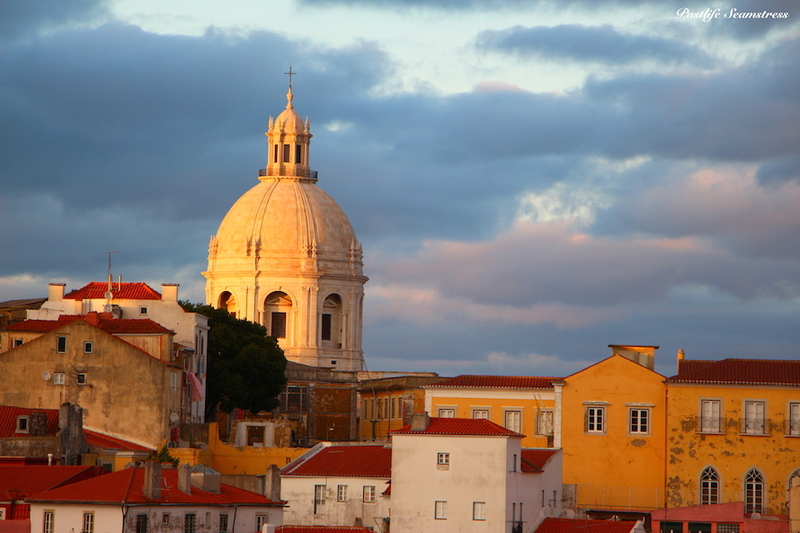 One of the many things that Lisbon is known for are its miradouros or view points. 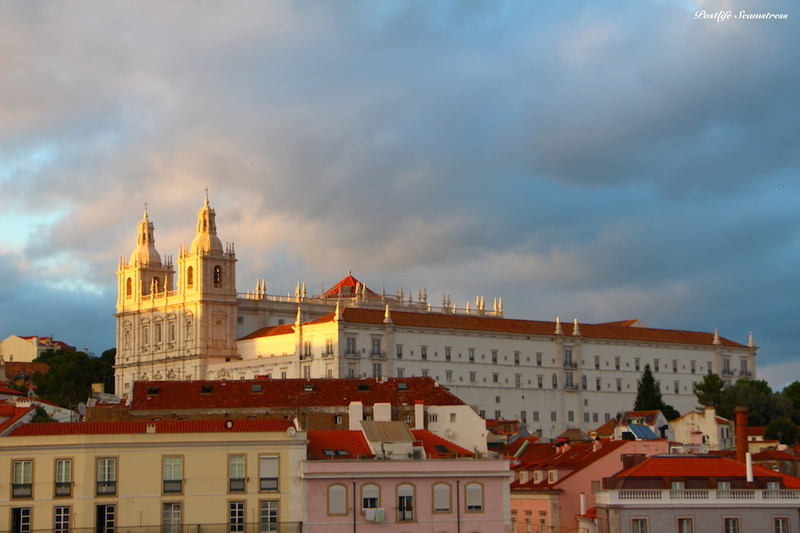 There usually is one or just a few in a city’s kitty but Lisbon takes the cake here as well. 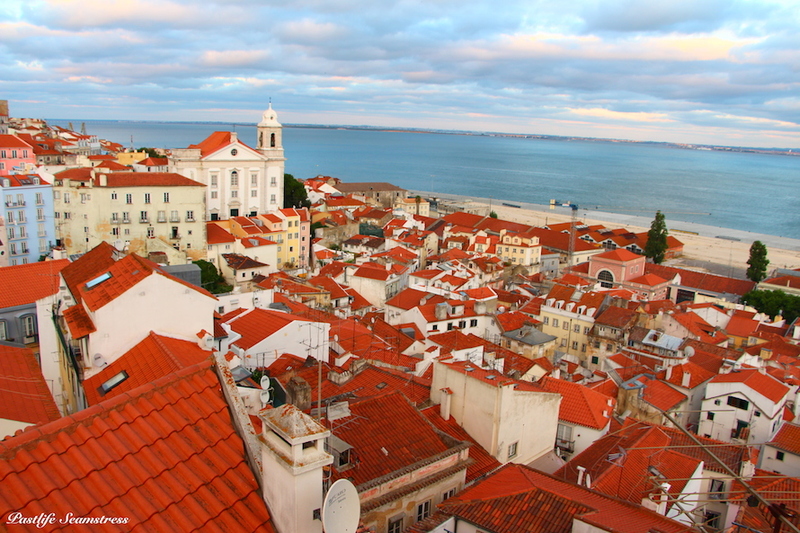 Spread over seven hills Lisbon teems with viewpoints. They are as lovely as they are difficult to pronounce let alone remember and I thought French was giving me a hard time! While doing all in a short trip is more of a mission than leisure (and even redundant, if I may say so), doing some is an absolute must. But whether one such view-point did overlay nicer thoughts on the existing ones lies at the end of post. Read on. 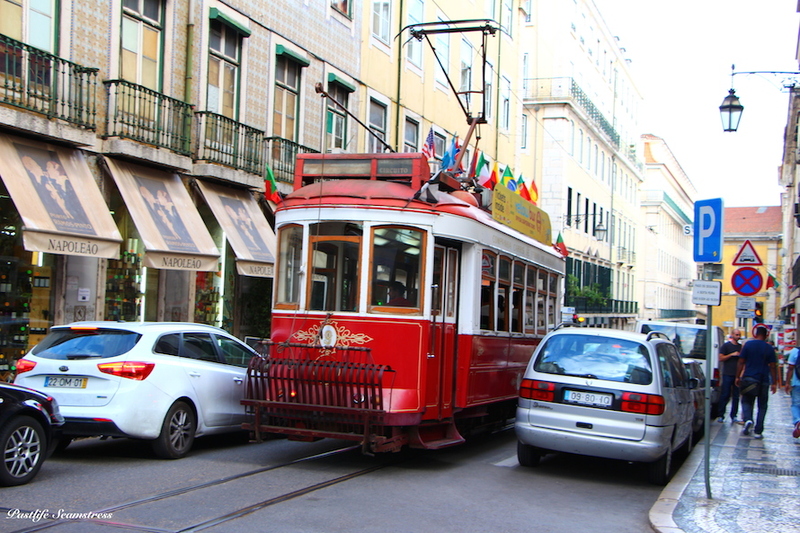 While much of the much advertised fascination associated with a European holiday is about walking those grey cobbled alleys laid between charming pastel houses on either side you’d be so grateful for trams in Lisbon. Take it from someone who loves to walk. 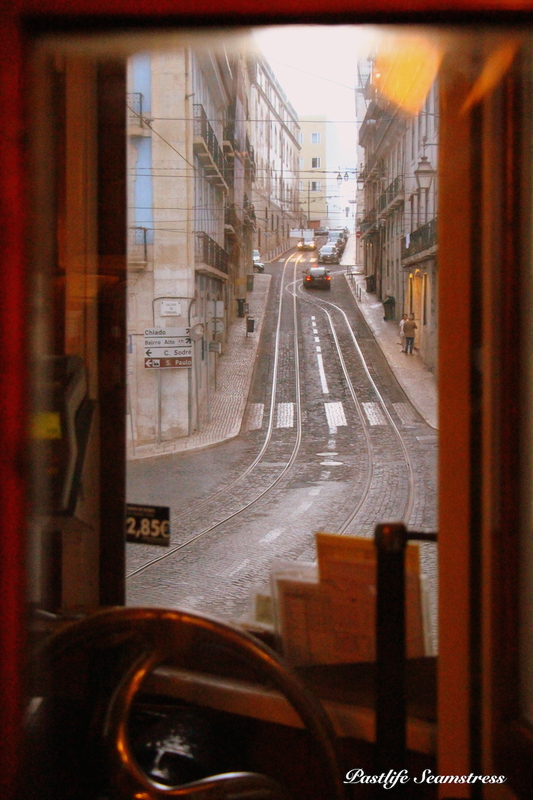 Additionally seeing a bit of Lisboa through a tram window is a must-do especially since Elevador da Glória is also a national monument and even if you are someone who likes to see things up close, well, especially then. This is Elevador da Glória or simply known as Gloria. 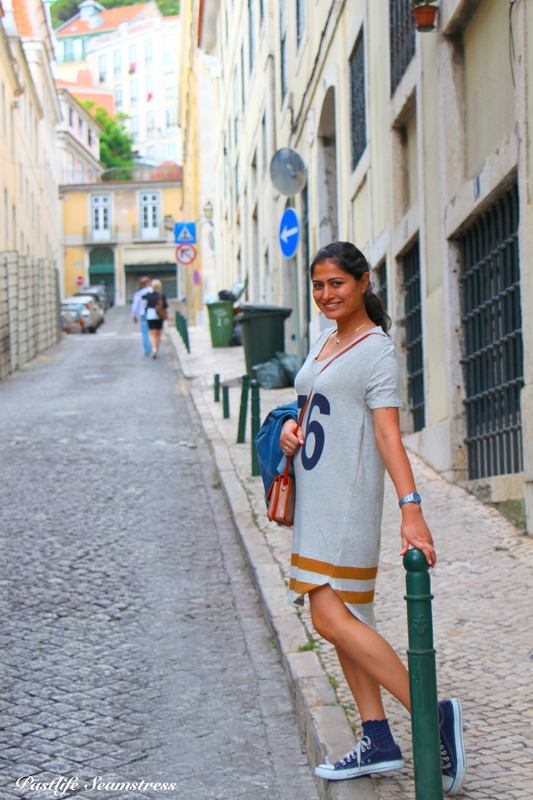 Glória is like a graceful old lady from the 1800’s usually seen in her classic yellow dress (let’s say it’s avant-garde in picture) clamping and clonking her way between downtown & Bairro Alto area. Glória drops you at a hop away from Miradouro de São Pedro de Alcantara. A small park with some eye catching tile work and Greco-Roman fountain is the stage for this Miradouro. By the way these are my go-to shoes in summer and I talked/bragged/shared about it here last year. Remember? The view point at Miradouro de São Pedro de Alcantara. Honestly, that’s not a very good representation (it looks more like a studio picture) of the miradouro but even so it wasn’t very impressive. This particular view points looks over red roofed city quarters and St. George’s Castle at it’s farthest end. Aside from a couple who were fighting over their old-enough-to-be-embarrassed-about-it children, a newly wed couple with their photographer and some quick on feet tourists it wasn’t particularly crowded for an evening visit. There was no reason for it to be. And so we moved on too. 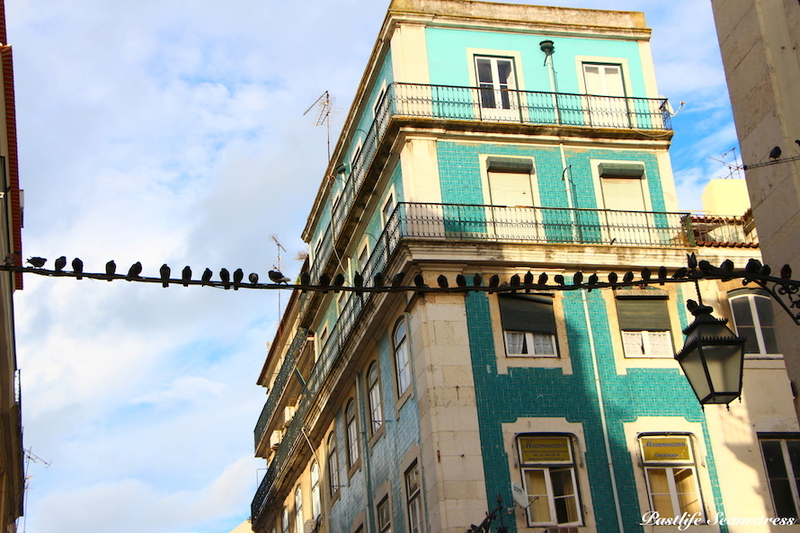 Bairro Alto & Chiado are two neighbouring neighbourhoods. 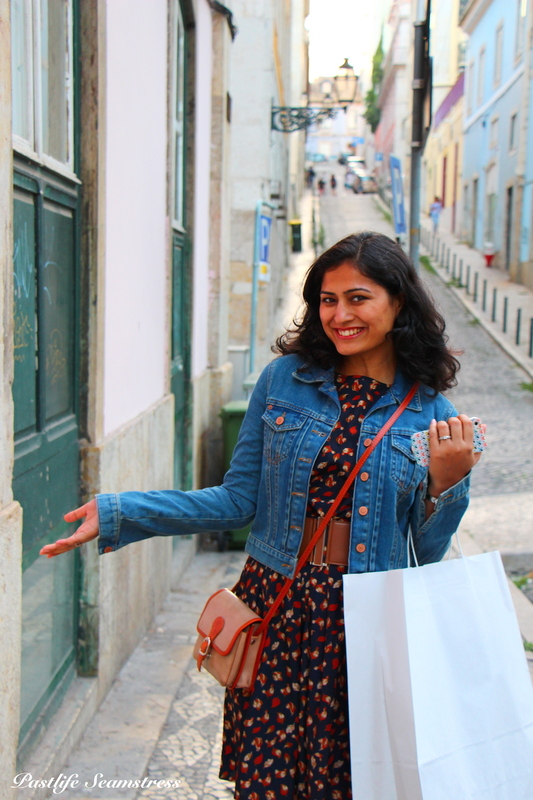 While Bairro Alto is more down to earth working class quarter area dotted with Fado houses and clever stores, Chiado is more upscale, sophisticated with bookstores, cafés and stores with a bourgeois feel to it. 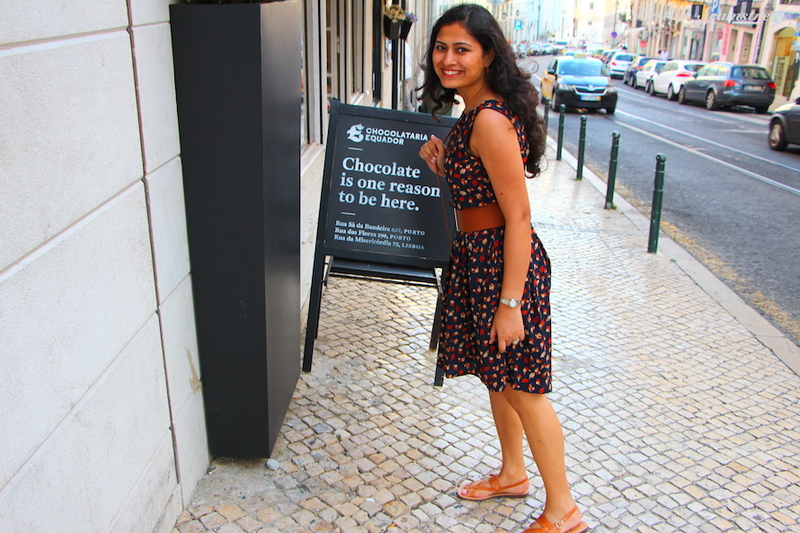 Decadent stores like ‘Tous’ are no less of a tourist attraction of Chiado. Getting a ticket at Rua de São Pedro de oh! forget about it. 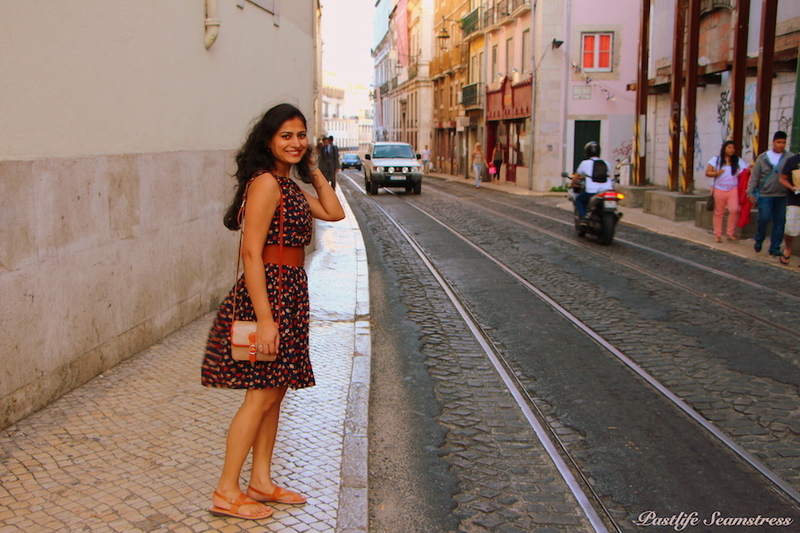 It was somewhere in Bairro Alto. It was an atmospheric neighbourhood, alright, but even though it looked festive, it did not feel festive. However you always Shopatherapy to rescue! While roaming one of these unfamiliar streets I found a cork store which you’d find plentiful in Lisbon anyway that’s been a life saver since. Well, what I mean to say is do yourself a favour and buy one of the all-natural bag made of cork. The shop recommendation is ARTELUSA and the link is below. They have quite interesting stores only not so conspicuous as they should be, deserve to be. Like this one. Pretty clever huh? 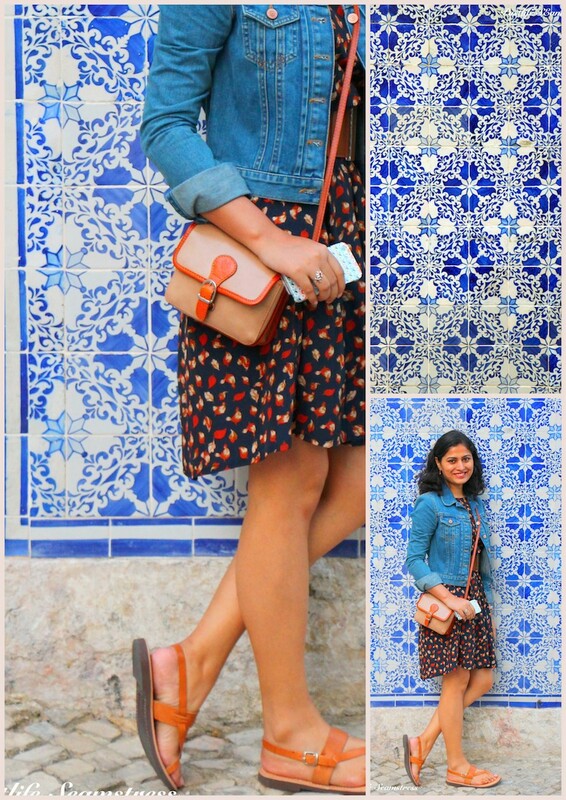 Lovely Azulejos or painted ceramic tiles would pop up to add some bright kind of blues all over Lisbon. As much picturesque as it looks here there was no easy way going up and down these streets and I wondered if the city was built on a giant old roller coaster!! 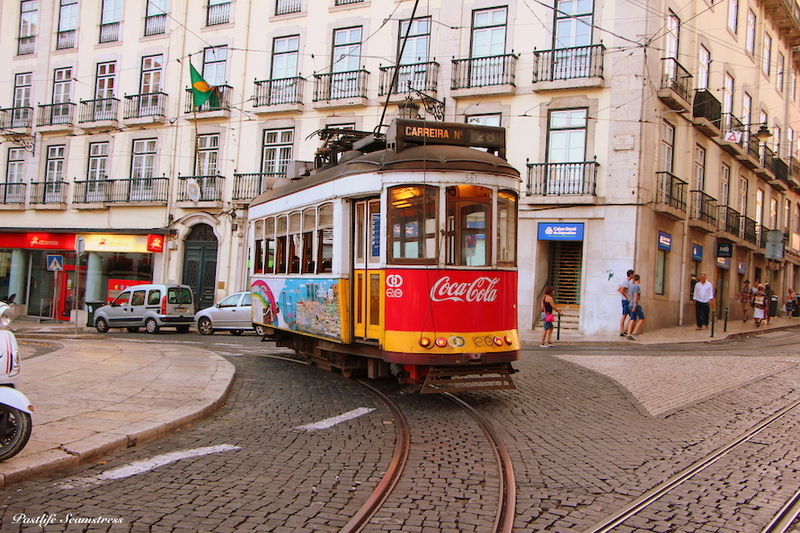 Besides Glória Tram 28 at LARGO DO CAMÕES is another famous tram. 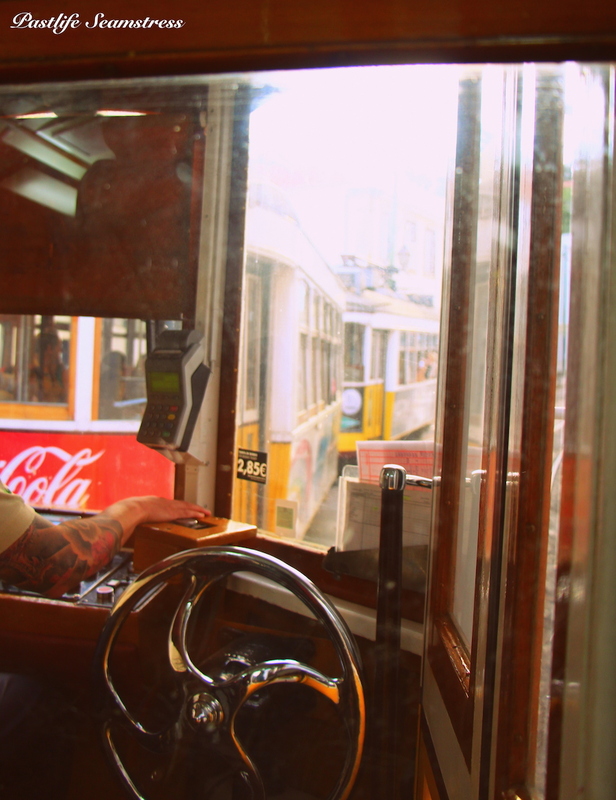 The tram 28’s trail is the most popular one in Lisbon, despite the full forty minute journey on a stiff wooden seat, that is, if you’re lucky to grab one. The tram is really really old and negotiates it’s way through even older neighbourhoods, its not a ride, its a good proxy for a time travel! 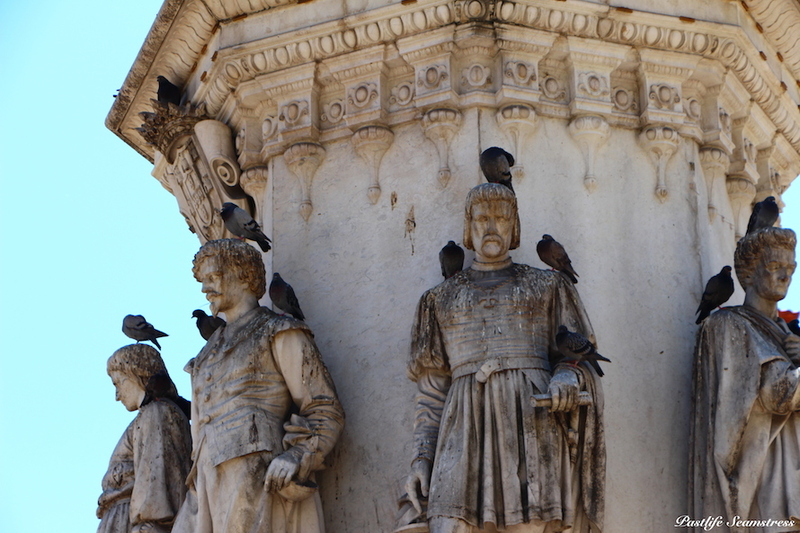 Statues at Luís de Camões. They look upon everyone, but no one looked after them! As a friend puts it aptly ”the higher you go in life, the more sh** you get”. 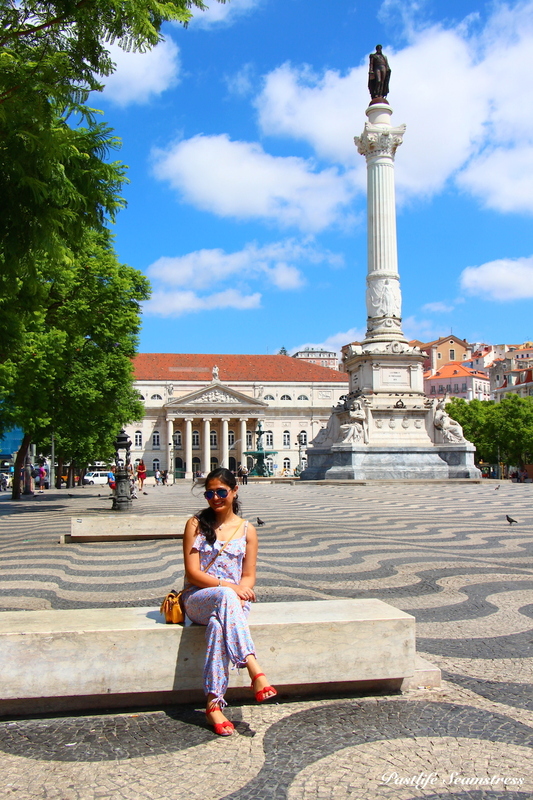 And the love and loathing with Lisbon continued on as we found ourselves pretty much by ourselves at what was supposed to be the most lively square of Lisbon where someone took us for potential pot customers. For a moment it took my mind off being so censorious of this so called liveliest square and I was stunned at how bad his profiling of buyers was! Because it wasn’t even at the end of the day where a haggard ‘me’ could understand his confusion. Either way, loooong way to go chap!! Praça Dom Pedro and Rossio Square with Teatro Nacional in background. A tourists’ map of city gets quite busy around this area with points of interest like Santa Justa Elevator for ‘great views of entire city’, Rua Augusta (main shopping street), Rossio station (a grand train station) and then some. 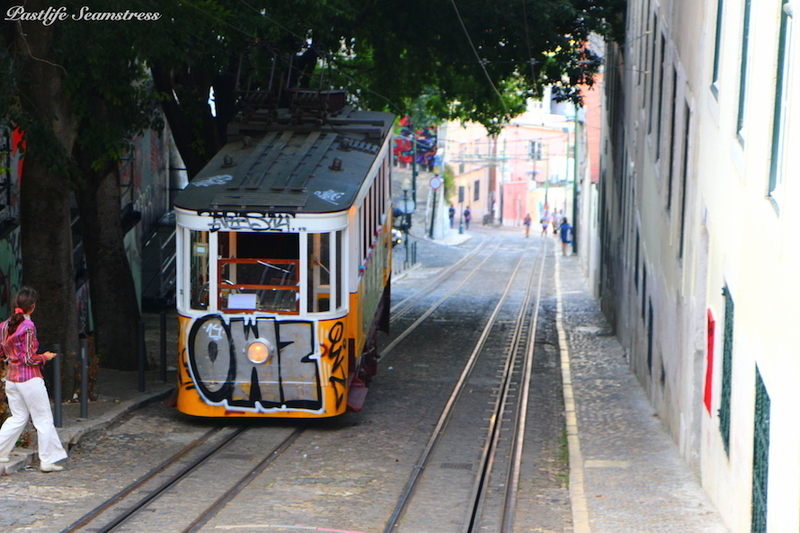 Trams passing at hair’s breadth through R. dos Fanqueiros is ‘just another day’ in Lisbon. 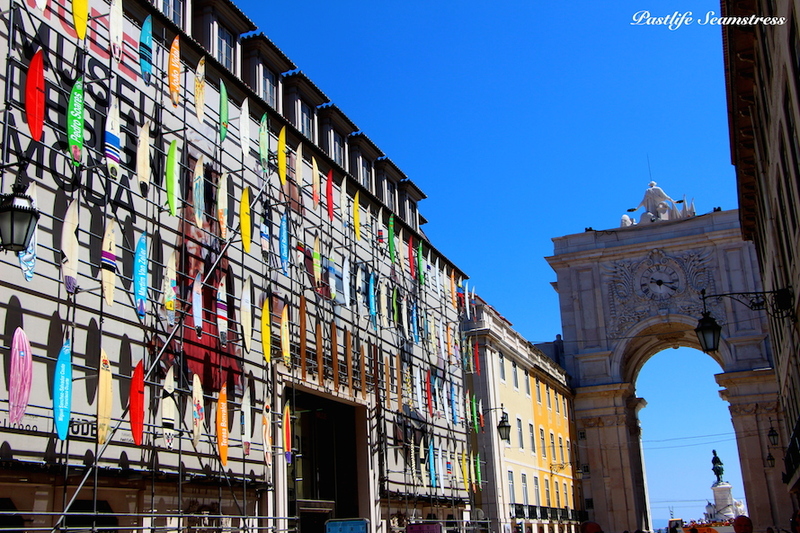 Surf board scaffold at MUDE – Museu Do Design E Da Moda (Museum of Modern Design) at Rua Augusta near Praça do Comércio with Arc of Rua Augusta in sight. 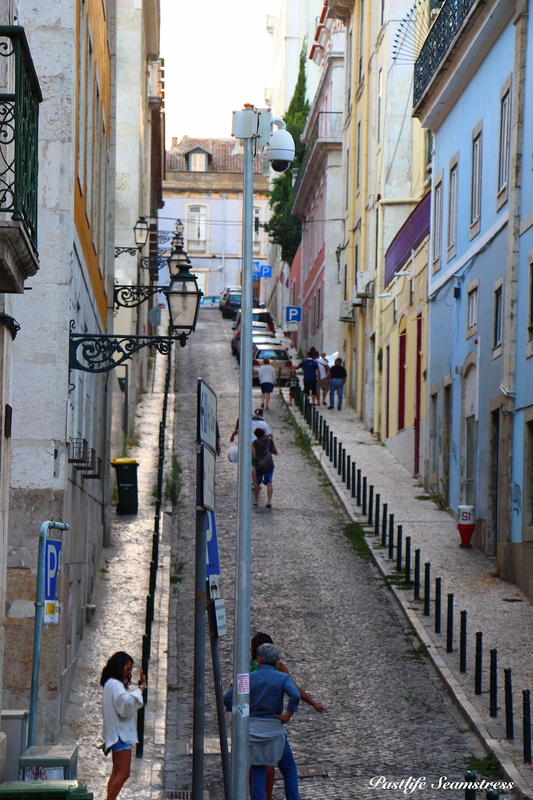 Alleys near Igreja da Madalena while waiting for tram 28. 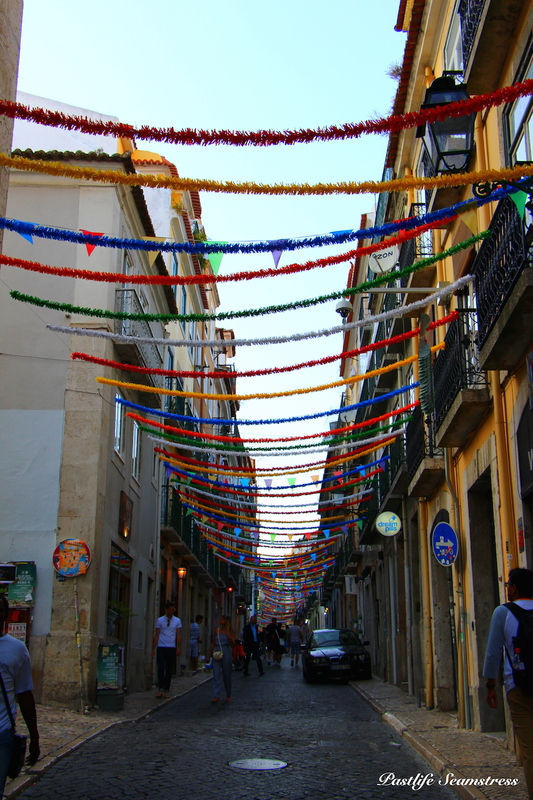 I don’t know but Lisbon continued to feel empty of people therefore vitality day after day, alley after alley. A couple of no.28s crossing. If hitherto all this seemed superannuated, once in a tram I failed to keep a sense of time (aside from the fanny packed tourists 😛 ). The tram seemed to be squeezing through areas stuck in the 70s . 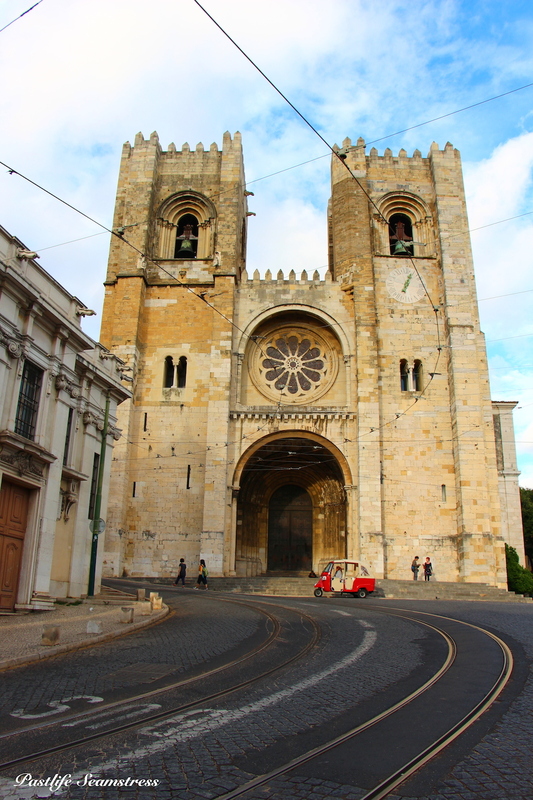 I even googled ‘Lisbon in 70s’ and it really does not look very different now. See for yourself! The journey was eerily quiet and although heading towards a very ‘popular’ destination felt devoid of all purpose at times. The warning of ‘beware of pick pockets’ had been amply spread about that every body looked at each other with a suspicion no less than that of Sherlock Holmes. From the drop of point of tram we walked gingerly uphill for about half an hour, joined on the way by several cats and another solo traveller catching her breathe and looking for point of view. Et Voila! 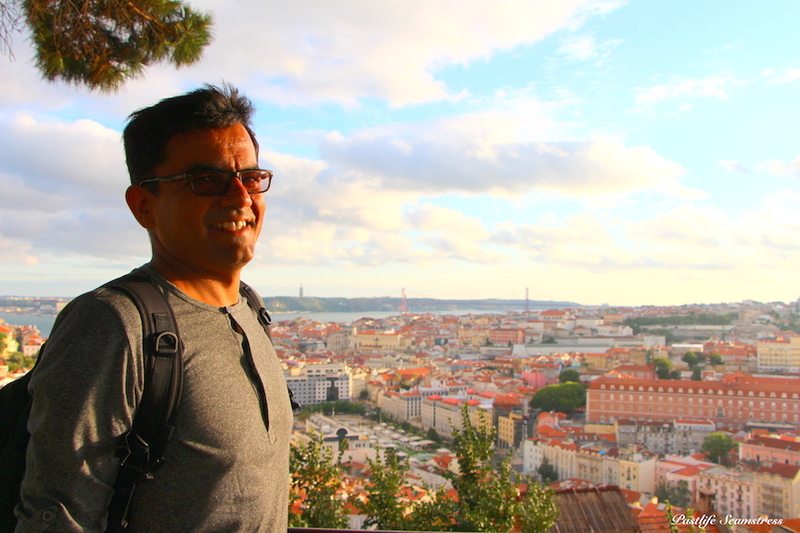 there it was Miradouro da Nossa Senhora do Monte! View of Ponte 25 de Abril from Miradouro da Senhora do Monte. Well, the view was, as they say, worth it. It’s a beautiful place to be at sunset. On our way back we stopped at another viewpoint – miradouro de Santa Luzia which seemed to be a more popular and more populous place. There’s a brasserie and a few rooftop restaurants around should you wish to soak in the views longer. The reds are quite reflective, don’t you think? 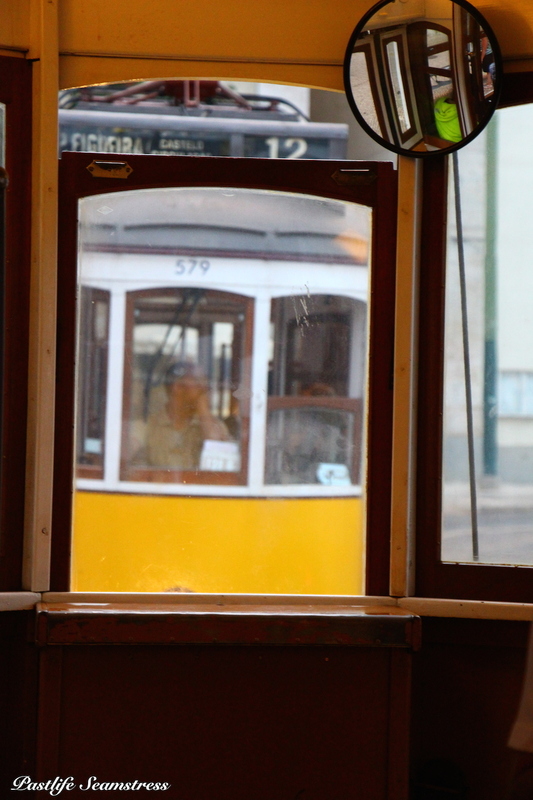 A last hop in the tram and we’re happy to say goodbye to Lisbon! 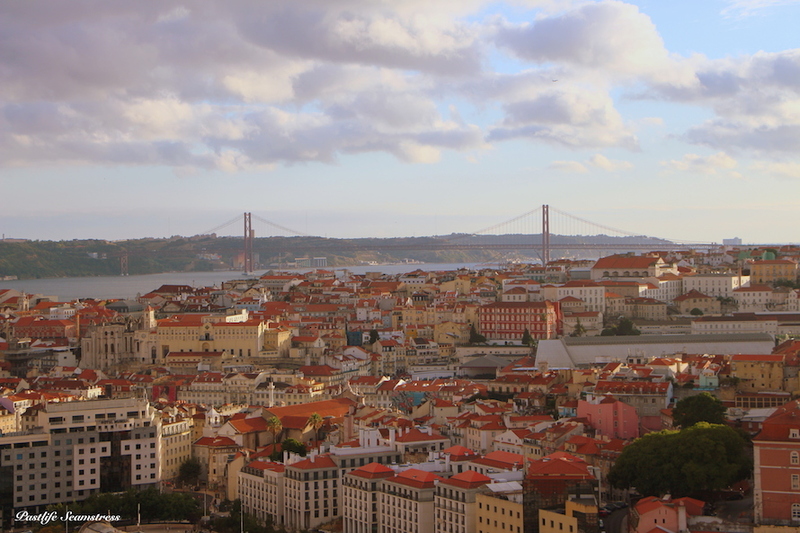 The following is the last image of Lisbon that we have in our folder. 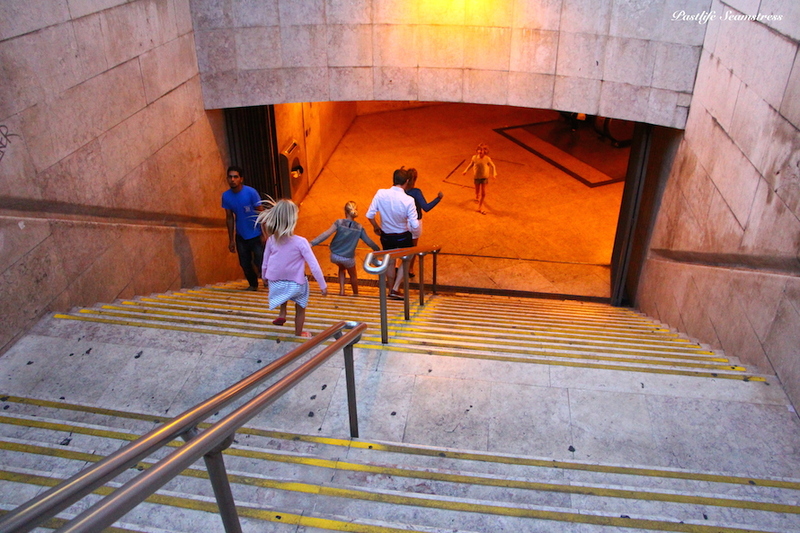 It was one of the few happy sights I saw in Lisbon – a family happily squealing and dashing across to catch the train like little flies moving towards the source of light. 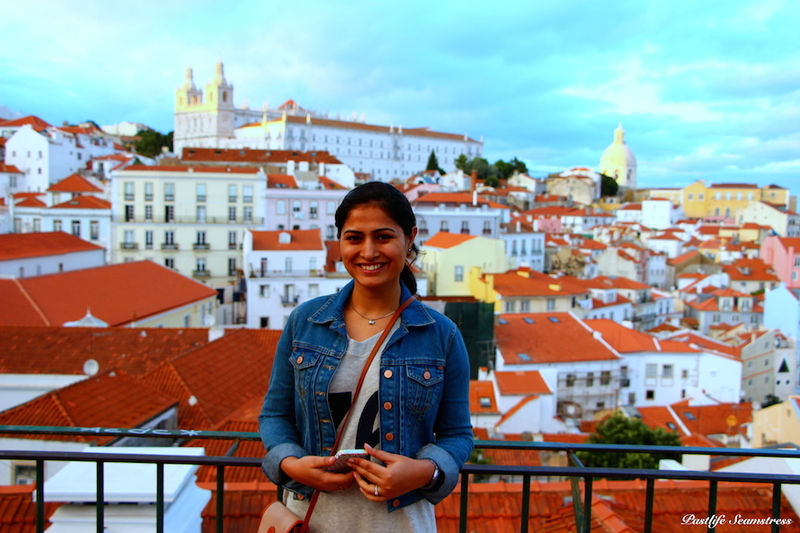 It is, effortlessly, the most vibrant memory of Lisbon in my mind! 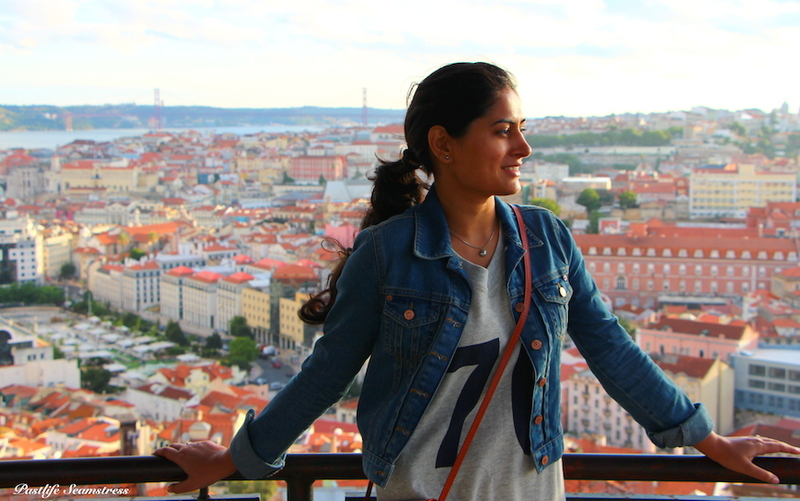 I’m happy to bring the curtain down on Lisbon but not on Portugal yet. 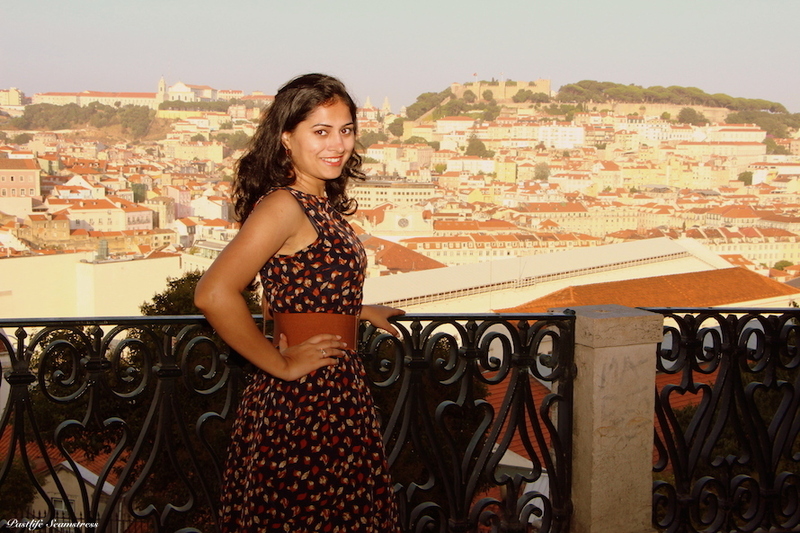 We made a day trip to Sintra which I’m dreading to write for similar reasons. 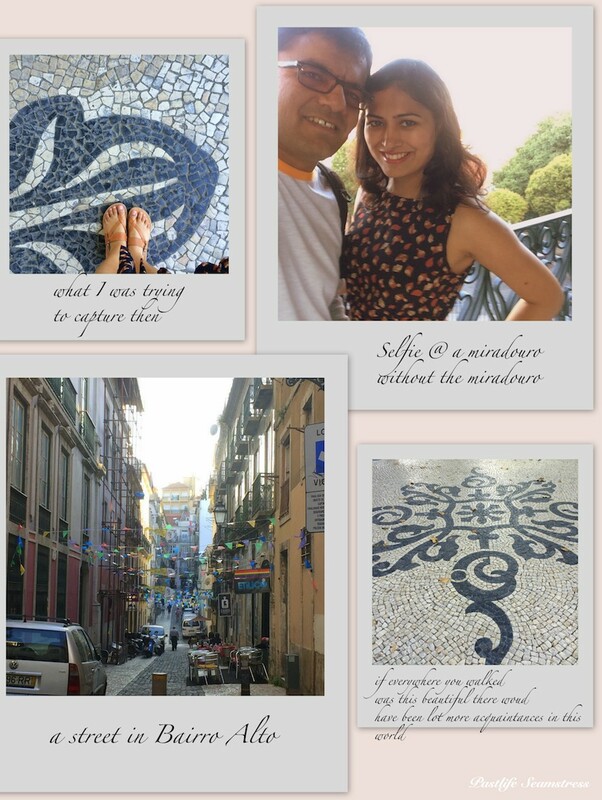 We also visited Porto for a couple of days. As of Lisbon, it did feel like an explorers home, a home belonging to a pathfinder who left on a bigger quest, closed doors waiting muted for it’s master to return with it’s weather beaten windows for eyes shut in conjecture. You can’t help feeling sad. Gloom just saps out and sweeps you in. So yes, a breathtaking miradouro we did find, but not a reason to go back. May be we didn’t time it well, may be we were at the wrong places at the wrong time, may be it was the weather, I don’t know but I do have someone in agreement on this, same country other town. a) Watch out for sun if travelling in summer. b) Shop Recommendations : A Vida Portuguesa (for it’s souvenirs and authenticity) Artelusa (for cork products). c) Some good websites for planning the trip are here and here. 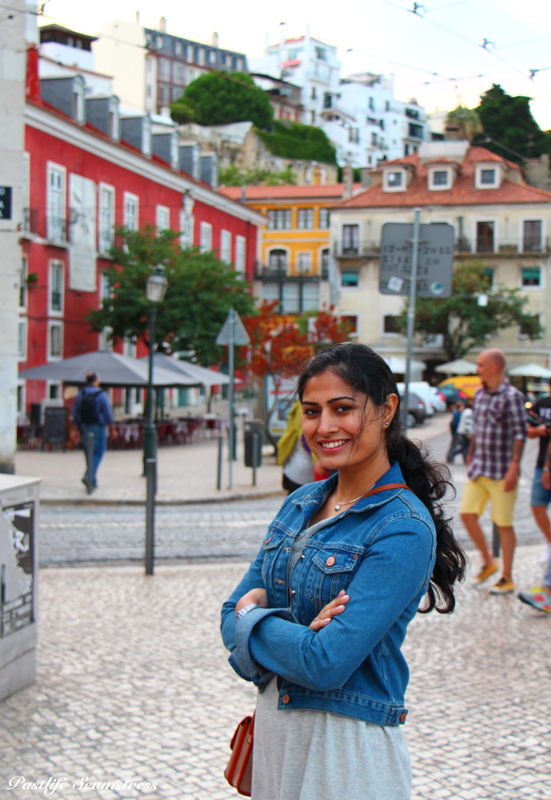 d) Although Portugal has rich culinary heritage especially for pescatarians, vegans are advised to look for restaurants in advance for unhappy taste buds do not make happy travellers. 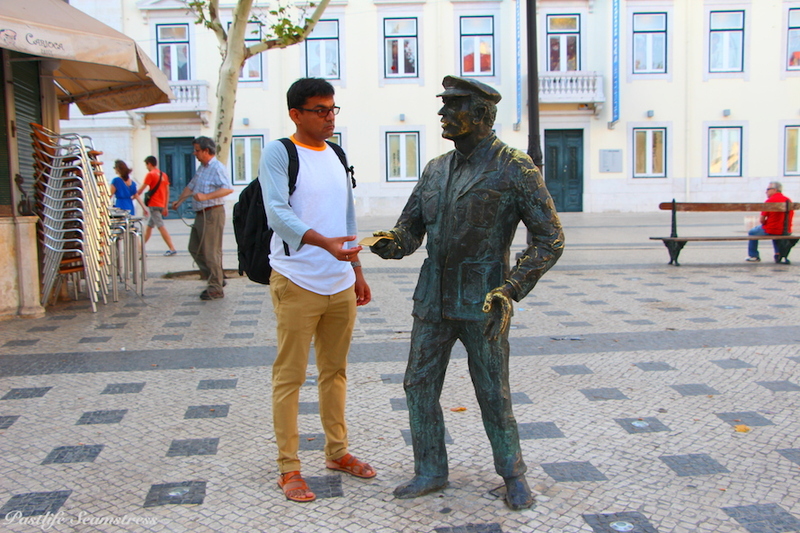 e) Travel on Couch with A Night Train to Lisbon – an intriguing Woody Allen film. 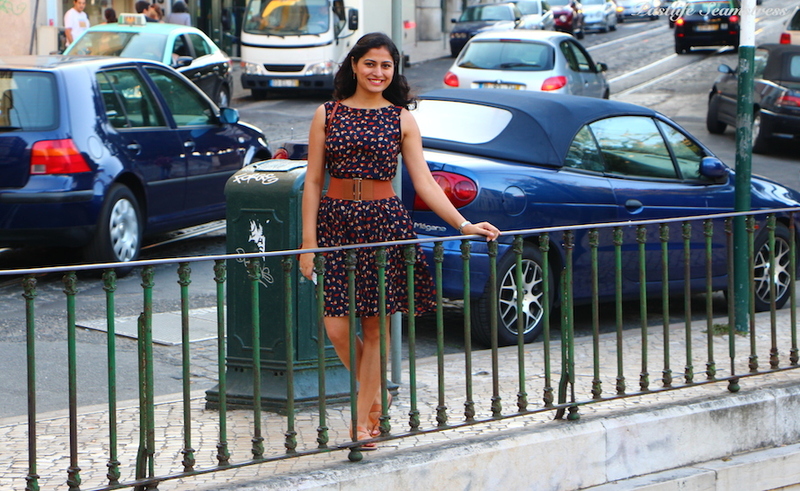 on Lisbon!!! Well taken .very useful tips.good job,stay blessed dear. Nice pics,sunsets or sunrise –both are looking great. 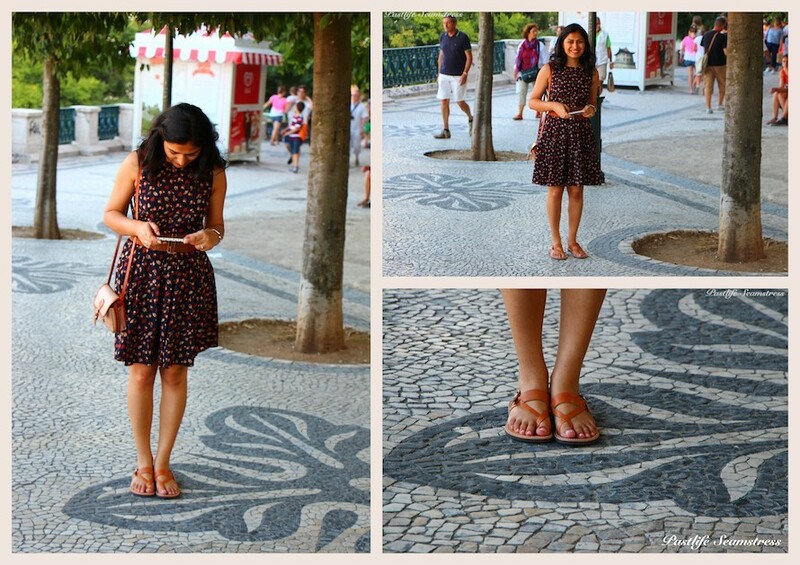 Lisbon like never before………Awesomely explained. Loved the snaps!!! Two smiling faces & Lisbon!! !